(Oakland, CA)—Commemorating 20 years of one of the most engaging, dynamic, and popular observances of Days of the Dead, Oakland Museum of California (OMCA) will present Songs and Sorrows: Dí­as de Los Muertos 20th Anniversary, an exhibition running October 8, 2014 through January 4, 2015 in the OMCA Gallery of California Art. Artistic and community voices from the past, present, and future will come together for this year’s Días de los Muertos exhibition, marking two decades of the Oakland Museum of California’s commitment to uniting Bay Area communities around healing and remembrance. Co-curated by OMCA Curator of Public Practice Evelyn Orantes and Guest Curator Bea Carrillo-Hocker, Songs and Sorrows will highlight contributions from pioneers of Días de los Muertos celebrations in the Bay Area and newer voices that continue to evolve this living tradition. 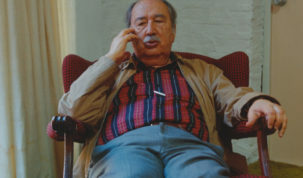 The exhibition will include works from Jose Guadalupe Posada, Carmen Lomas Garza, and Jesse Hernandez, and photographs from Mary J. Andrade among others. Community groups including students and faculty from Oakland School of the Arts, Skyline High School, and Maya Lin School in Alameda will create papier mache masks inspired by the Linares Family of Mexico City and Guatemalan kites of remembrance as ofrendas. In addition, 20 important works from the collection of The Mexican Museum and from the history and art collections of OMCA will enhance the exhibition and enrich the centuries-old story of Days of the Dead as it has evolved from pre-Hispanic through colonial and into our own time. The 20th Annual Days of the Dead Community Celebration, taking place in the Museum gardens on Sunday, October 26, 2014 and featuring food, dance, music groups, colorful altars, and more, brings the community together for this healing tradition. For more information about the exhibition, community celebration, and other Days of the Dead public programs, visit museumca.org. • A large-scale mural by illustrator and vinyl toy customizer Jesse Hernandez who paints in a style known as Urban Aztec. 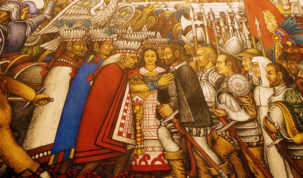 The mural honors the ancient Aztec goddess Mictecacihuatl, The Lady of the Underworld, who in pre-Hispanic times was believed to preside over the bones of the dead in Mictlan, the underworld, with her male counterpart Mictlantecuthli. 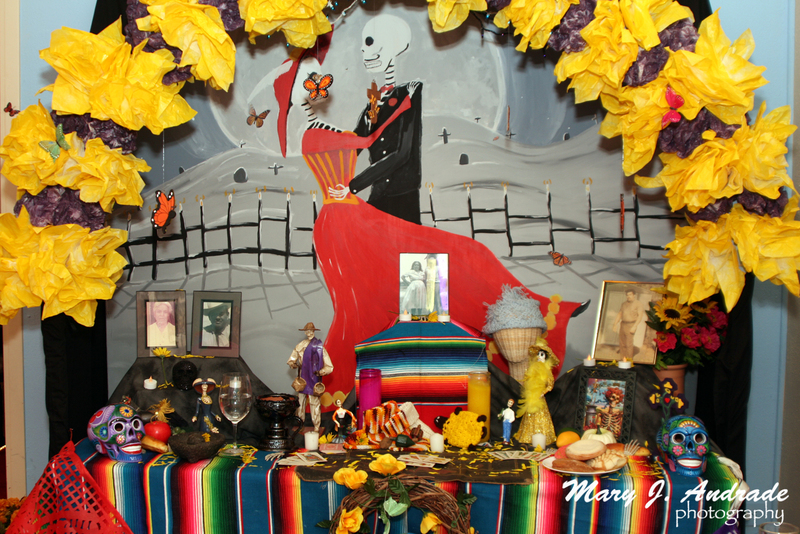 • A heartfelt ofrenda by Chicana artist Carmen Lomas Garza, one of the pioneers who brought Days of the Dead traditions to the Bay Area. Her ofrenda honors her maternal grandfather who taught her the value of growing vegetables and fruits and sharing the harvest with family. • A sand carpet created by artist Calixto Robles will depict the image of the Virgen de Guadalupe emerging from a lotus flower, in the tradition of the magnificent sand carpet displays seen in the town squares of Oaxaca, Mexico. • A whimsical installation by artist Viviana Paredes of a soul in transition between life and death. • An installation of paper mache skeletons by artist Marcus Cordero in honor of the singers Lola Beltran, Selena, and Donna Summer. The installation is inspired by the work of the Linares family of artisans from Mexico City and infused with the spirit of the iconic Days of the Dead figure La Catrina (The Elegant One) with a contemporary pop spin. Songs and Sorrows: Días de los Muertos 20th Anniversary is made possible in part by generous support from the Oakland Museum Women’s Board, Kaiser Permanente and the California Arts Council.The 2014 Days of the Dead Community Celebration is made possible in part by generous support from Kaiser Permanente and the Oakland Museum Women’s Board. 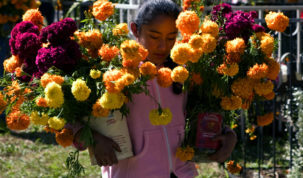 Celebrated annually between October 31 and November 2, the Mesoamerican tradition of Days of the Dead or Días de los Muertos is widely associated with iconic and colorful elements-such as sugar skulls, marigolds, and altars-or ofrendas-arranged or created in honor of deceased loved ones. OMCA’s annual Days of the Dead Community Celebration has been one of the Bay Area’s most popular community events, drawing thousands of participants yearly.